Quick Peak? Bing's Reign As #2 Search Engine Lasted One Day. A couple of days ago we reported statistics from StatCounter suggesting the Bing, Microsoft’s new “decision” engine, had bypassed Yahoo as the number 2 search engine in the U.S. and the world. Well guess what? 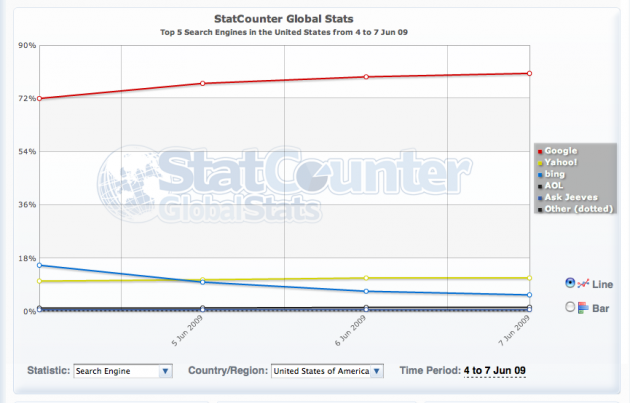 That same data suggests Bing reign as #2 was extremely short-lived: As in one day. Yes, the same data now suggests that just as quickly as Bing shot up, it’s now heading the opposite way. And in fact, it’s still falling. 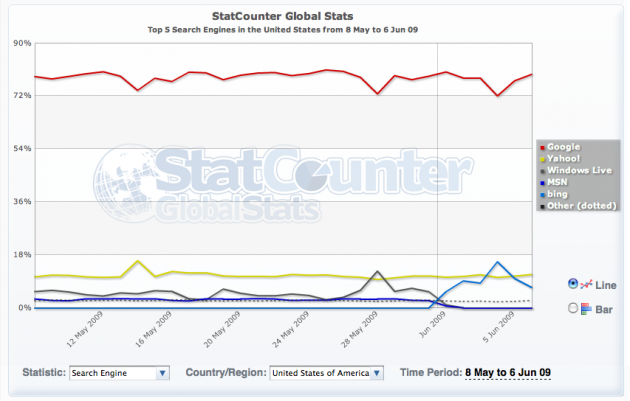 On June 4, Bing had over 15% of the U.S. search share market, according to the data. On the same day, Yahoo had just over 10%. The following day, Yahoo had almost 11% while Bing had fallen below 10%. 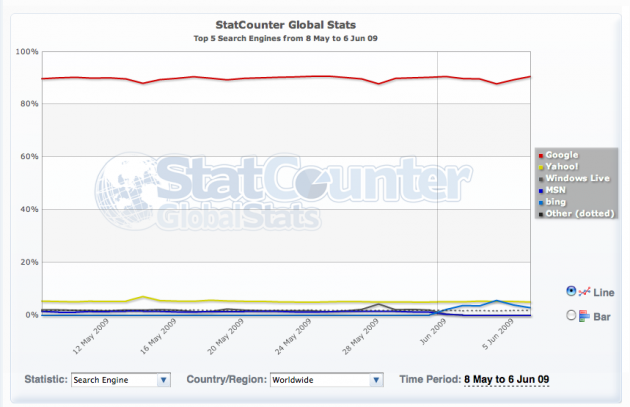 And yesterday, Bing had fallen to 6.68% while Yahoo rose again to 11.33%. Meanwhile, the same data suggests that while Google took a big dip during Bing’s reign, it too has now started moving back upwards as Bing declines. Not that Google was in any real danger — on June 4 (the day of Bing’s #2 position), Google had fallen to 72% of searches in the U.S. Now it’s just about back up to 80%. Worldwide data shows the story to be basically the exact same. 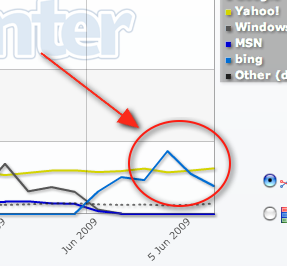 Bing was #2 for a day then Yahoo regained its place as Bing fell. Of course, it’s important to note that StatCounter is not the be-all end-all measurement tool for such numbers. It claims to track the browsing behavior of over 2 million users across 3 million sites. But the overall trend is undeniable — Bing shot to fame quickly, and once the initial hype wore off, it’s now falling back down. Microsoft needs to keep pushing those TV and web ads to keep its name in people’s minds. Otherwise, Bing runs the risk of having already peaked. Update: As Matt Cutts (who yes, works for Google) points out in the comments, StatCounter updates every few hours, so there is also data for today already. And it’s more bad news for Bing. It’s now down to 5.65% in the U.S. — yes, that’s less than what Live.com was at last month.